People light candles outside Kronan school in Trollhattan, Sweden following a knife attack on Thursday, October 23, 2015. The man who stabbed two people to death at a school in Sweden before being shot and killed by police had a racist motive and had planned the attack, police said Friday. 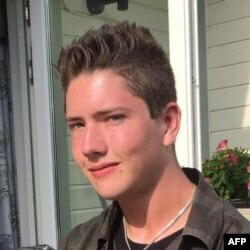 The 21-year-old masked man, entered the school in southern Sweden Thursday and stabbed four people, two of whom died, before he was shot by police. He later died of his wounds. A photo widely distributed by Swedish media taken from the Facebook page shows Anton Lundin-Pettersson, the alleged perpetrator of the attack at a school in Trollhattan, southwestern Sweden, October 22, 2015. Senior police officer Niclas Hallgren told a news conference that surveillance videos show the attacker roaming inside the school with a sword and a sharp knife and said "his way of marching points to Nazism." Evidence show that he acted alone and police found "a kind of suicide note" in his apartment after the stabbing, investigator Thord Haraldsson added. Police also found the sword's holster inside a car parked nearby the school that the attacker could have used, Haraldsson said. Trollhattan were foreign-born, according to official figures, with most coming from the Middle East, the Balkans and Ethiopia. A majority of the students at Kronan are foreign-born. 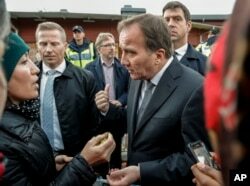 Prime Minister Stefan Lofven, right, talks to local people near the school Thursday afternoon where a masked man wielding what looked like a sword stabbed four people Thursday October 22, 2015, in Trollhattan, Southern Sweden.